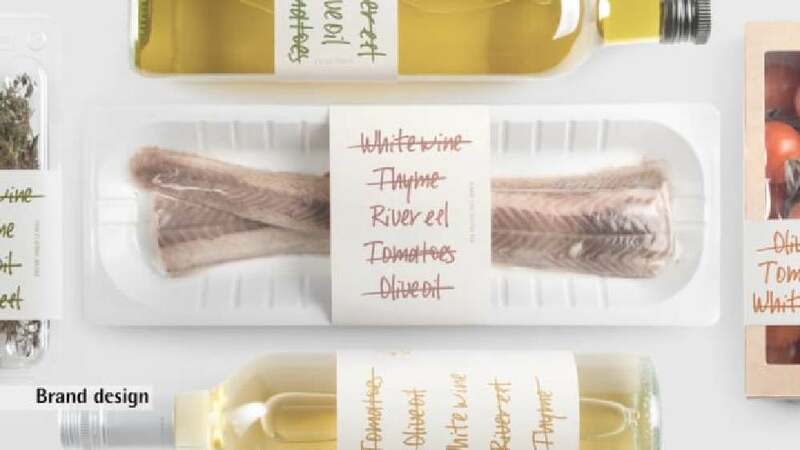 This brand design of a private label was created based on the simplest and most iconic metaphor of shopping, the shopping list, as such lists help people remember what they need to buy. The design is kept as plain and clear as possible and needs no decorative elements except for the font, which looks handwritten. All the labels of the different food packagings feature several words typically found on shopping lists. Only the word for the product that is inside the box or bottle is not crossed out. This is enough to inform customers sufficiently what is included in the packaging. The typography comes in slightly different colours only to highlight the individual products, but otherwise makes the products unambiguously recognisable as one brand. The idea was born of the realisation that today’s consumers are rather busy and do not want to waste time on examining thousands of logos, colours and images when buying just basic foods. The brand aimed at a design where nothing diverts the attention of the customer – making shopping as easy as following a shopping list. In this project, the concept of a shopping list serving as a brand design delivers a very delightful and charming realisation. The design of the product labels is simple and straightforward, only needs a minimum of resources, and attracts attention with its innovative look no matter where it is displayed. In addition, it also gives consumers the chance to buy what they may forget otherwise.